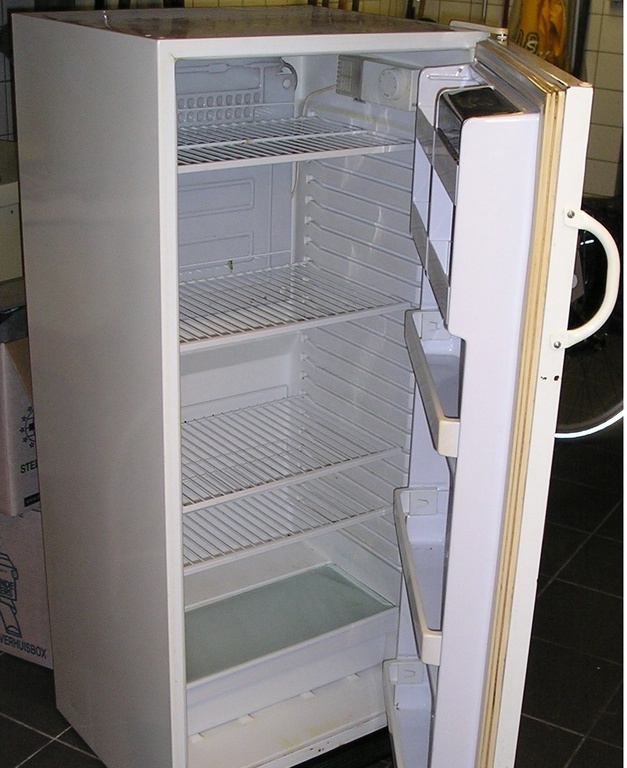 This article shows that you can save energy by converting an old freezer into a refrigerator. The result is a refrigerator that is more economical than the most efficient A + + refrigerator (This is an indication of the most efficient appliances on a European efficiency scale). Due to circumstances, we had a freezer available for which we had no more direct application. Selling in a yardsale, of course, was an option, but usually that doesn’t generate much money (perhaps therefore a good idea to buy a freezer yourself in this way). As a freezer has significantly better insulation than a refrigerator and we have a 2nd refrigerator in use, it seemed like a fun experiment to me, to convert the freezer into a refrigerator and see what this meant in relation to energy use. Indeed strange, that if you think about it, the temperature difference over the wall of a refrigerator about 15°C (59 °F) is equal to the temperature difference over the wall of a house. Outside heating season average of 5°C (41°F) in Holland and inside 20°C (68°F) while the walls of houses today have a proper insulation thickness. I do not know what the building regulations require nowadays, but my guess is, that it will be a minimum of 6-8 cm (2.4-3.2 inch) or more?. 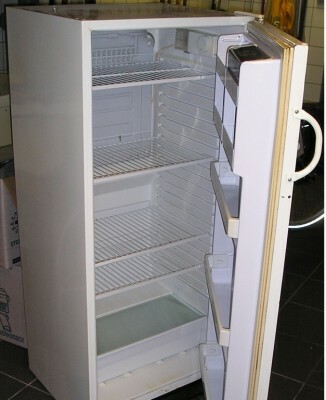 While a refrigerator often has to operate with only 2 cm (0.8 inch)! Well as said, as done. 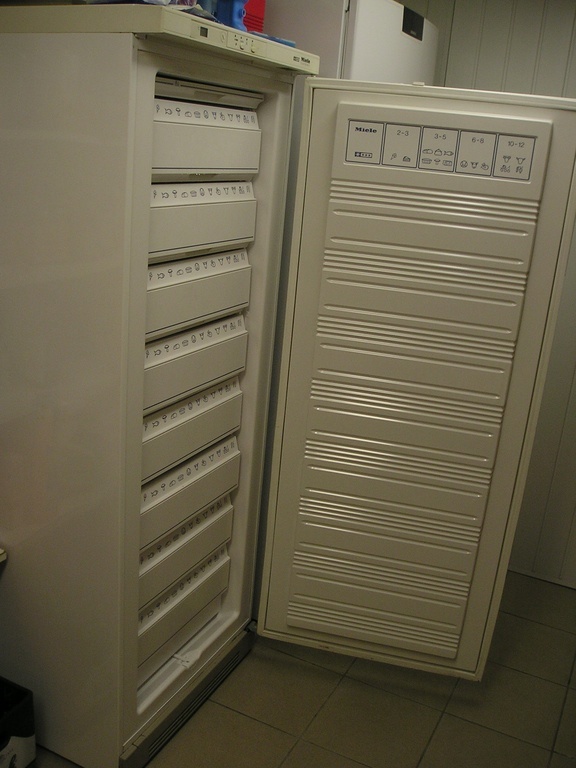 A Miele brand freezer of approximately 250 liter (66 gallon) was the starting point. Electronics (thermostat, alarm, digital thermometer display, etc) were removed. The electronic temperature sensor could easily be pulled out at the back of the cabinet, after the removal of a plug. This has been done, in such a way, that I can convert it back, so that (if necessary) also the freezer can be used again as such. An electronic thermostat from a kit of Conrad (part# 19 48 83, at € 14, -) was built. Of course, a type was chosen, suitable for the temperature of a refrigerator at least for the range of 0-15°C (32-59°F). The thermostat was built and connected to the relay in the live wire to the compressor (as, of course, was already the case in the original thermostat). After switching on, the thermostat was set at 5°C (41°F) and the energy consumption was measured with one of those handy “in between” meters (Energy Check 3000 at € 20, -) also offered by Conrad. The measurements were conducted over 4 days. Converted to an annual consumption, it was 47 kWh! By comparison, some energy consumptions (per year) of new refrigerators with similar volume follow hereafter. The energy consumption numbers below are taken from the Dutch review website www.kieskeurig.nl. We had an old (2nd) refrigerator with a capacity of 200 liter (52.8 gallon) in use, with an annual consumption of about 225 kWh. Thus now we have a saving of 178 kWh/year. At an average kWh price (high/low rate) of € 0.21 it means savings of around € 37, – / year. The savings compared to an average Dutch household consumption of 3500 kWh per year is with 178 kWh / year about 5.1%. That is (in terms of electricity consumption) already almost the 6% Kyoto target! Are there any disadvantages? Yes, there is no drain available for the condensed moisture. There is therefore an occasional drop of water on the goods in the refrigerator. After this experiment I’m asking myself whether it would be difficult for the European Commission (with a number of stringent environmental objectives), to just impose rules for future refrigerators to be sold in the European Union. For example, one could imagine that from 2015 on, only refrigerators with energy label A ++++ are allowed to be sold. Besides refrigerators of course rules can be imposed, for many more types of devices imposing a certain maximum consumption. This is a very interesting experiment, but I am wondering about the safety issues of mold and mildew growing in the device now that water is occasionally dripping into the interior and onto the food. Have you noticed this? It’s only occasional and only in the top drawer. Probably because there is the coldest part of the evaporator. When you put your bottles and plastic containers / boxes in the top drawer, there shoudln’t be a problem. Also keep in mind, that there’s always water in a normal refrigerator. It’s condensing on the backwall, where it’s collected and directed to the outside of the refrigerator (mostly to the top of the compressor, where it evaporates again). The efficiency probably comes from the only door being at the top, and therefore you dont lose all your cold every time you open the door, Not from the insulation. There’s no top door. There’s only one door. content of (empty!) freezer is 200 liter=0.2 m3=0.25kg of air as a maximum. 3.8 * 20 * 365 = 27,740 kJ/yr = 7.7 kWh of heat. 7.7 / 2 = 3.85 kWh / yr.
For the ease of the calculation I supposed dry air. Leaving the door open for a longer period is a different story ofcourse, but just refreshing the air is not so bad. This does bring to mind the amount of energy required to cool items that are put into the refrigerator that are warmer than the air in the appliance and to maintain that temperature. Doesn’t an empty refrigerator use less energy than one that is full, and certainly one that is VERY full, so that the cooled air cannot circulated around the items? is a table that compares those. Diepvrieskast (side door) 200 liter uses 147 kWh a year. It could be that the standing freezers have worse isolation by default, or it could be that the energy content of water has to be included in the calculations. This is an interesting experiment (and one I’d wish I’d thought of before I tossed out an old freezer): Bravo to you, Zwerius! I have a couple of questions: Does the compressor cycle much less frequently than a traditional refrigerator, taking longer to lower the temperature of food newly added? And did you remove the defroster control circuit? I see you’re paying as much for electricity as we are in New York city! I guess that’s ultimately good for the environment, because it encourages innovation and conservation? The compressor only starts every few hours or so. Just runs for a few minutes. From the energyconsumption of 47 kWh yearly, it can be calculated, that it will run about one hour a day (considering a fairly standard 125 W compressor). I never looked at the effect of newly added food, but don’t expect it to be much different from an original refrigerator. This freezer didn’t have a defroster. So there was nothing to remove (but in case it would have been there, I would have it removed). I’m in the process of converting a small freezer to a ‘cold beverage’ fridge. Googling will point you to some experts who believe that the freezer compresser isn’t made for this job. I don’t claim to be such an expert, but they indicate that the short runs are hard on the compressor. The net result is a shortened life… Food for thought. I’m going to try this anyway. You are welcome to our website dedicated to filters of all kinds. We also have a wide range of refrigerator water filters. We deliver your order super fast. First of all, I do not mean to insult anyone, but if it entertains, then be it. If my post insults anyone, please accept my deepest apologies. When I saw this page, I’m sorry, but I was ROTFLMAO! The reason is that “zweris” or “zhveris”) in my language means “a wild untamed animal” for example a “lynx” or a wolf or a bear, etc. So I always used the nickname “zwerius” (which in my language means “a small, but wild animal”, Germans would probably say “tierchen”) on my girlfriend. So today when I accidentally found out that Zwerius is actually a man’;s name, I was wildly entertained, so to speak. No insult meant, but could the owner of the name ZWERIUS explain the origin of his name? That would be so cool and thank t’you very much for not scalping me for this. I am going to use a frost-free upright freezer in that I want the air circulation and the condensate has a path to drain. Has anyone made completed such a conversion? I have a question. I found a HVAC chat site that said that this sort of conversion would be a bad idea because the freezer’s compressor is gas cooled (or something) and that the warmer setting would cause the compressor to crap out early. My question is: Now that you have been using your new refrigerator for a while, is it still running okay? refrigerator is still working fine. A year after Zwerius’ last comment, any status updates on performance, reliablity, and energy use? The two pictures shown above are so different as to suggest two different freezers. Nothing changed. Still operating well. I’ll try to do some energy measurements again in the coming month. As promised, I did a measurement again. The measurement was over a period of 7 days. Converted to an annual consumption, it was 51 kWh! So this is pretty close to the original measurement of January 2009, where I came at 47 KWh/year. that’s right. One was the old refrigerator that we used in the past. The other one (with drawers) is the freezer that was converted to refrigerator.